. Published on February 28, 2018 . A calm day at the Art & Art History computer lab! It occurred to me that maybe some of you are curious about the tiny details of everyday grad school life. I’ve complied a list of slightly obscure questions and their totally true factoids answers to help calm some of your millions of questions. Q: SHOULD I WEAR MY STUDENT ID ON A LANYARD AROUND MY NECK? A: You totally can, if you want. However you choose to house it, you’ll be reaching for your Student ID a lot. To gain entry to building you will need to show your ID to building security and you’ll use it to check out books from the library and tech equipment. There are also many discounts to museums and restaurants near campus that require showing that magical piece of plastic. A: Maybe. I’d say that having some reliable computer (desktop or laptop) at home will be helpful for writing papers, researching, and submitting assignments on time. On campus, there are computers located in the library for use by students from any program. 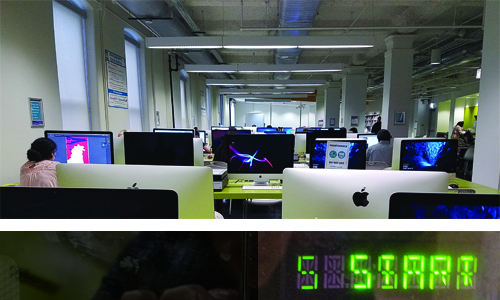 Additionally, the Art and Art history department has several computer labs that feature updated Adobe Creative Cloud software and huge screens for eye-strain free working. The hours are generous and there are always computers free (it does get busy at finals). The computer labs also have high quality self-service black and white and color printers and prints are paid for using your campus card. There are also laptops that grad students are able to check out and use. 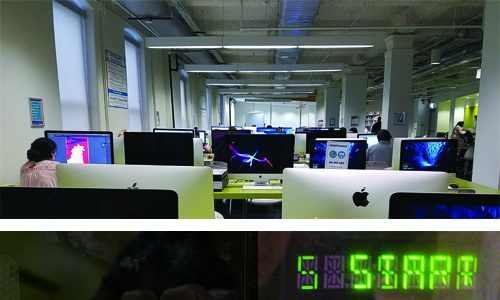 If you do decide to buy a new computer you should check out Columbia College Chicago’s Tech Center. A: There are plenty of places near campus to grab a quick bite and Trader Joe’s is a cohort favorite. I tend to pack my lunch because it saves money and time. 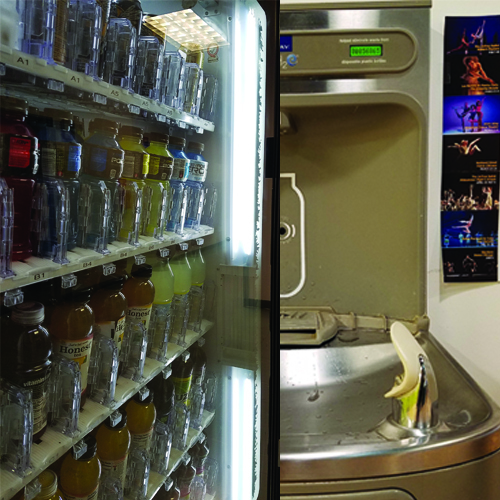 There are Vendi-teria (a word I maybe made up to describe multiple vending machines in a row-like a mini cafeteria) in all buildings I’ve been to on campus. There is often a microwave near the vending machines so you can reheat all your delicious leftovers. Grad School Bonus Protip: Take hydration seriously. Q: DOES THE WATER TASTE WEIRD? A: Nope, there are fancy water fountains that dispense filtered water and have bottle refill options so buy your self a nice reusable water bottle and avoid the bottle water tax (yep, that’s a thing). A: Your schedule will change every semester based on which courses you take. Generally speaking, most classes are at least 3 hours long per week and meet once a week. There are some classes that don’t run the full 15 weeks of the semester so they meet for more hours per meeting. As for class times, I’ve had classes that start as early as 8:30am and I’ve had classes get out as late as 10:20 p.m. but no classes will run from 8:30 a.m. until 10:20 p.m. (thankfully)! Q: DO PEOPLE USE STILL USE PEN AND PAPER TO TAKE NOTES IN CLASS? A: Truth be told, I’m a sucker for school supplies. Everyone has their own style, and many people rely on computers and tablets to take notes during classes. I’m sorta old school and prefer to take notes with pen and paper and organize everything in a binder. I’d say I’m in the minority with my old fashion ways. Find a system that clicks for you and run with it. Most courses do require that you turn in papers and assignments using CANVAS, the online learning management system Columbia uses. So, having access to a computer at some point in your workflow is pretty essential even if you decide to go nuts and buy every color highlighter. Q: WHAT IF I GET A JURY SUMMONS? A: This just happened to me! It turns out you can be excused from jury duty if you are a full-time student, you simply mail in a couple of verification documents. According to my extensive internet research they excuse jurors on a case by case basis so make sure you call the phone number on your summons and send in paperwork early.